BOND: Revisiting THE SPY WHO LOVED ME | Warped Factor - Words in the Key of Geek. By 1977, James Bond was in trouble. The series had been left on life support for the better of a decade as it went through three different actors, a shift in tone and behind the scene difficulties that saw co-producer Harry Saltzman leave the series in the hands of Albert R. Broccoli. All this meant that Broccoli’s first outing as solo producer of the Bond films, The Spy Who Loved Me, would be the installment that would decide the future of the series. Thankfully it was a film that would see Bond return to heights the series hadn’t seen in years, and would prove to be best Bond film of the 1970s. The success of The Spy Who Loved Me begins with Roger Moore’s James Bond. Moore’s first two outings had seen him settling in and trying to find his feet in the role, if not simply sleepwalking through them. In his third Bond film, Moore finally found his Bond. This Bond was suave, charming, seductive but nevertheless capable of great intelligence if not being downright coldblooded. Moore also finally gets to act in the film as well, such as in the scene between Bond and Anya in their hotel room in Sardinia where the tension between the two character’s goes from friendly to tense in the space of a few lines. Bond’s humor is also more contained or, at the very least, serves the story well rather then dumped into it. As a result, Moore gives one of his best performances as 007. Also bringing about a change to the series was Barbara Bach as KGB Major Anya Amasova. Anya would prove to be almost as much a foil for Bond as a romantic interest. She one ups Bond on numerous occasions, yet proves to be believable as the two character’s eventually get together in the way Bond films work. Bach in turn gives Anya strength and yet also vulnerability. After such pretty but dumb Bond girls, such as Tiffany Case and Mary Goodnight, Anya would prove to be one of the best Bond girls of the series and a definite bonus to the film as whole. Completing the main cast was of course the villain: Curt Jurgens as Karl Stromberg. Stromberg comes from the Goldfinger and Blofeld schools of Bond villains, in that he basically just gives orders throughout the film. Yet Jurgens plays Stromberg with a strong sense of menace, with the occasional charm, something that is apparent throughout the first meeting between the hero and the villain. Stromberg proves that, despite not being a physical menace, Bond villains can work with the right actor in the part. The supporting cast is excellent as well. 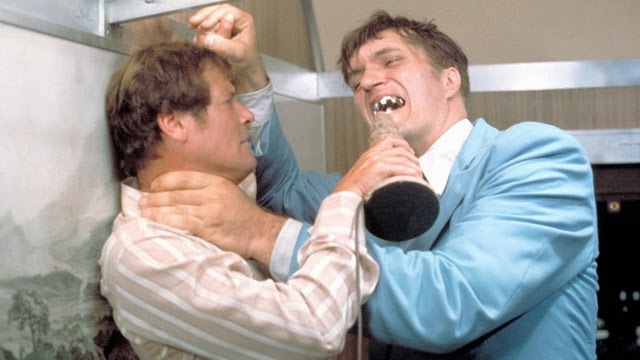 Richard Kiel makes his debut as the henchman Jaws and comes across as an actual menace throughout the film, though this is somewhat undermined in a couple of places by some inappropriate humor. Moving on, we have Walter Gotell as KGB General Gogol, Geoffrey Keen as defense minister Sir Frederick Gray, Caroline Munro as henchwoman Naomi, Edward De Souza as Sheikh Hosein and Vernon Dobtcheff as Max Kalba. Many of those characters only appear in a scene or maybe two but make quite an impression nevertheless. That isn’t forgetting the series regulars of Bernard Lee as M, Lois Maxwell as Moneypenny and Desmond Llewelyn as Q. The result is one of the best supporting casts for any Bond film. The production values of The Spy Who Loved Me are stunning. 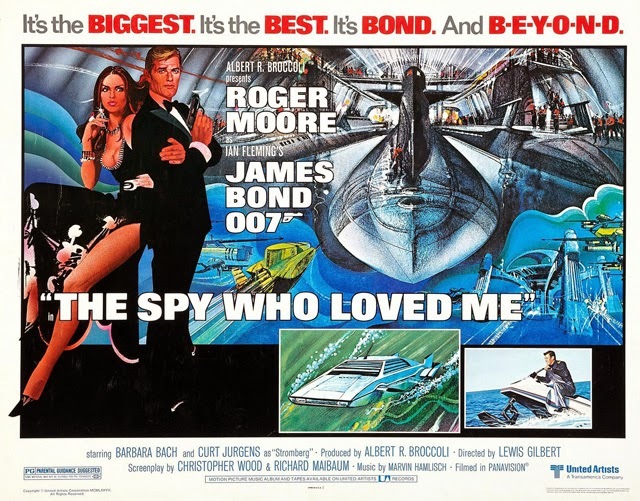 Production designer Ken Adam, famous for his work on previous Bond films, returned for this one to do some of his best work of the series, ranging from Gogol’s office, to the interiors of Stromberg’s Atlantis laboratory, to the truly incredible set inside the Liparus tanker. Adams’ earned an Oscar nomination for his work here, and it’s a shame that he didn’t win for it. Backing up Adam’s production design is the equally exquisite model work of Derek Meddings, which makes the most incredible parts of the film exactly that: incredible. The cinematography of Claude Renoir remains some of the best seen in the series to date. The result is one of the best of the Bond films on a visual level. The action sequences of the film remain some of the most iconic of the entire series. The film begins with a classic Bond pre-credit sequence - a well filmed ski chase that leads up into one of the best stunts the series has ever produced. From there The Spy Who Loved Me showcases excellent fight scenes, a car chase/underwater sequence that turned the Lotus Esprit into an iconic Bond car, and a pitch battle with the fate of the world hanging in the balance. These action sequences hold up well even over three and a half decades later, something that is remarkable for any film let alone Bond. The heart of The Spy Who Loved Me really lies in its script by Richard Maibaum and Christopher Wood. It moves away from the largely jokey and predictable formula of the early 1970s Bond films and harkens back to the Bond movies of the previous decade. In particular, the influence of You Only Live Twice can be felt, but the film manages to improve upon that film by bringing it down to Earth. The script mixes the fantastic with the believable as it ranges from a webbed finger villain with a tanker capable of swallowing nuclear submarines, yet also plays with the Cold War and the tensions between those on opposing sides. It’s also a script filled with excellent dialogue and humor, something that definitely improved upon on the previous film in the series. The only really mixed element of the entire film is the score from Oscar winning American composer Marvin Hamlisch. It takes the John Barry influence and adds a disco feel to it, something that makes it an oddity. There are moments when it genuinely works but it is very much a product of its time, with the result being very dated today. Yet the score also gives us one of the best theme tunes of the series: Nobody Does It Better as sung by Carly Simon. The song, combined with Maurice Binder’s fantastic title sequence, is superb, and is also put to good use in the score itself. Yet despite the song, the dated disco feel makes the score a rather mixed affair. The Spy Who Loved Me proved to be the film that would finally take the Bond series of life support. Even now, it is a film full of good performances, excellent production values, fine action sequences and a good script. Bond was back in action and rarely has he been better. Matthew lives in North Alabama where he's a nerd, doesn't have a southern accent and isn't a Republican. He's a host of both the Big Finish centric Stories From The Vortex podcast and the 20mb Doctor Who Podcast. You can read more of his writing at his blog and at The Terrible Zodin fanzine, amongst other places.